Somerille, Mass - East Boston is a blue-collar, rough-and-tumble part of town. On the east side of the Boston Harbor, it is the site of Logan Airport. It is also the setting for much of the Academy Award-winning mob-movie, Mystic River. But most importantly, Eastie is the home of Santarpio's, the pizza place that constantly tops the lists of Boston's best pizza pies. It's interesting how these best-pizza lists go. There is always a nod to trendy places with gourmet toppings, a la Cambridge 1. (Think oddly-shaped thin-crust pizza, topped with portabella, roasted onion and asiago cheese.) There are only a handful of pizzas and salads on the menu - all of them unexpected and delicious - but perhaps not what you had in mind when you went out for pizza. Even Emma's - our little neighborhood pizza place that is up the street in Kendall Square - gets kudos for its creative combinations of toppings sitting on a crispy crust. 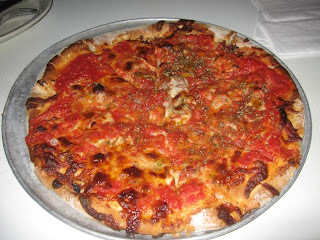 (At Emma's I usually opt for the #1 - caramelized onions, roasted red peppers, mozzarella cheese and the unbeatable spicy rosemary tomato sauce.) Plus, Emma's has a friendly-neighborhood vibe and it's right across from the movie theater, so it's an ideal date destination. While Cambridge 1 and Emma's often appear on these best-in-Boston lists, they rarely occupy the number one spot. That place of honor is reserved for an old-school institution like Santarpio's. I went to Santarpio's for the first time on Friday and I was not disappointed. First of all, the place is infamous for its service culture - or lack thereof - which was on full display. The host (using that term very loosely) instructed us to wait outside for our table for five people. When it was ready, we watched him shove the door open and yell "Five! ", then disappear into the divey restaurant, without waiting to see if we followed. Inside, Boston Bruins' posters and neon beer signs adorn the wood-paneled walls. A wood counter gives a glimpse into the kitchen, where the pizza chefs work their magic. A gruff waitress offered us a menu, but we declined, as there are only about three things on it anyway. 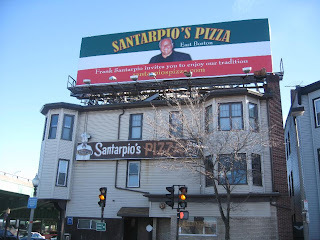 My friend Scott is a self-proclaimed Santarpio's specialist (actually, he an aficionado of all pizza, but Santarpio's is definitely at the top of his list). Scott advised "Whatever you do, don't order salad and don't order water." Apparently when somebody ordered a glass of water on a previous visit, the waiter replied "What do you think, this is the Meridien?" We got one cheese and one pepperoni pizza. This thin-crust pizza is unique for its extra crispy, crunchy texture. The well-done crust is topped with slightly sweet sauce, plenty of pepperoni and not too much cheese. Pretty simple, but definitely delectable. We also had an order of Italian sausage and grilled lamb. All that - plus beers - for $61. No wonder the place was packed. And what about the divey decor? The gruff service? As they say in East Boston, it's all part of the chaaaaahm. Somerville, Mass - Last week we went to see Transsiberian, the new "mystery-train movie" starring Woody Harrelson and Emily Mortimer. It was the perfect entertainment as I turn my attention to updating the Lonely Planet guide to the Trans-Siberian Railroad. As a film, Transsiberian is an entertaining and exciting thriller with a disappointing ending. Harrelson and Mortimer are an unknowing but likeable American couple, Roy and Jessie, traveling from Beijing to Moscow by train (technically the Trans-Manchurian branch of the railroad, but we won't get sidetracked by technicalities). Along the way, they meet up with a charming but dangerous drug-running duo and a duplicitous narcotics detective (Ben Kingsley), thus entangling themselves in a very messy drug transaction. The suspense-filled storyline unravels at the end. The NY Times review claims that "it gets sidetracked" but I'll take it a step further and call the ending a train wreck - in more ways than one. Much of the movie is actually flmed on the train, as it trundles through snow-covered Siberia. The cinematography is spectacular, giving a wonderful sense of the vastness of the landscape and the emptiness of the countryside. It is also a pretty accurate depiction of life on the train... the close quarters in the cabins, the sometimes raucous atmosphere in the dining car, the less-than-tantalizing toilet. If you ever wondered what it's like to ride the Trans-Siberian Railroad, this film will give you a good idea (minus the danger, death and destruction, most likely). Actually, there is no guarantee that you won't be embroiled in some sort of intrigue. Much of the film takes place in the tiny town of Ilansky, where our leading couple gets sidetracked. Turns out this is the same town where my co-author, Simon, once got arrested for taking photos of the old locomotive and water tower at the station. One recurring theme in the film is the unflinching nastiness of the provodnitsa, the train version of a flight attendant. In this film, the provodnitsa ignores the Americans' simple requests (no matter how loudly they are yelled at her in English); she pounds on doors and scowls at cameras; and she always, always yells. The biggest thrill of this thriller? Roy and Jessie use the Lonely Planet! My book on the Trans-Siberian Railroad is prominently featured, lying enticingly on the bunk in the train cabin, while the action takes place in the background. Maybe I'm not in the movies yet but my book is! Somerville, Mass - Since Georgia has been in the news, I decided to post on topic. I may not know much about politics, but I do know a thing or two about Georgian food and wine. This excerpt comes from the Moscow City Guide. According to Georgian legend, God took a supper break while creating the world. He became so involved with his meal that he inadvertently tripped over the high peaks of the Caucasus, spilling his food onto the land below. The land blessed by Heaven's table scraps was Georgia. Moscow is the best place outside the Caucasus to sample the rich, spicy cuisine of Georgia. This fertile region - wedged between East and West - has long been the beneficiary (and victim) of passing merchants and raiders. These influences are evident in Georgian cooking, which shows glimpses of Mediterranean and Middle Eastern flavours. The truly Georgian elements - the differences - are what make this cuisine so delectable. Most notably, many meat and vegetable dishes use ground walnuts or walnut oil as an integral ingredient, yielding a distinctive rich, nutty flavour. Also characteristic is the mix of spices, khmeli-suneli, which combines coriander, garlic, chillies, pepper and savoury with a saffron substitute made from dried marigold petals. Georgian chefs love to prepare their food over an open flame, and grilled meat is certainly among the most beloved items on any Georgian menu. Traditionally, however, meat was reserved for special occasions, and daily meals revolved around vegetables and greens. The fertile Georgian soil yields green beans, tomatoes, eggplants, mushrooms and garlic, all of which make their delicious way to the table. Herbs such as coriander, dill, parsley and green onions are often served fresh, with no preparation or sauce - a palate-cleansing counterpoint to the other rich dishes. Fruits such as grapes and pomegranates show up not only as dessert, but also as tart complements to roasted meats. Basturma Marinated, grilled meat, usually beef or lamb. Buglama Beef or veal stew with tomatoes, dill and garlic. Chakhokhbili Slow-cooked chicken with herbs and vegetables. Khachi puri Rich, cheesy bread, made with sour or salty cheese and served hot. Kharcho Thick, spicy beef soup made from stale bread soaked in yogurt. Khinkali Dumplings stuffed with lamb or a mixture of beef and pork. Lavash Flat bread used to wrap cheese, tomatoes, herbs or meat. Mkhali A vegetable puree with herbs and walnuts, most often made with beets or spinach. Pakhlava A walnut pastry similar to baklava, but made with sour-cream dough. Shilaplavi Rice pilaf, often with potatoes. Tolmas Vegetables (often tomatoes, eggplant or grape leaves) stuffed with beef. Wine is an essential part of any Georgian meal. At all but the most informal occasions, Georgians call on a tamada, or toastmaster, to ensure that glasses are raised and drinks topped up throughout the meal. Kindzmarauli A sickeningly sweet, blood-red wine which, appropriately enough, was the favourite of Stalin. Mukuzani A rather tannic red; it is the best known and oldest Georgian wine. Saperavi A dark, full-bodied red produced from grapes of the same name. Tsinandali Pale and fruity, the most popular Georgian white. Somerville, Mass - This week, Russia and Georgia went to war. Hundreds of people have died (thousands, according to some sources); and everyone laments the dire humanitarian crisis that has resulted. Meanwhile, the US-Russian relationship has reached new lows. Personally, I became aware of the increasing intensity of this situation only when I was unable to buy Georgian wine when I was in Russia. For several years the Russians have enforced a trade embargo against Georgia, closing off the primary market for the wine-producing country. Russians, of course, don't even notice the loss, because they now prefer French wine, but I was devastated! 1 - Very few people would confuse Georgia with a freedom-loving democracy. Yes, maybe President Bush would. But the reality, as always, is more complex. Georgia got a lot of international attention back in 2004, when the so-called Rose Revolution overturned the old regime and brought freedom-fighting President Saakashvili to power. But since then, the young `democracy' has faced a few obstacles. On several different occasions, charges of corruption within the government led to widespread protests. The administration responded violently, which did not help matters much. In late 2007, the president had to declare a state of emergency and call early elections to appease the angry protesters. We have read about how Georgia is keen to get into NATO, but its application was rejected - so far - due mainly to its checkered record with human rights violations and the ongoing conflict with the separatist regions of South Ossetia and Abkhazia. Which brings us to point #2. 2 - Georgia started it. Not to be third-grade about it, but Georgia sent its troops into South Ossetia on August 7, firing on civilian targets and Russian peace-keeping troops. For years, an uneasy truce has existed between Georgia and the separatists. South Ossetia and Abkhazia are technically part of Georgian territory, but they have been acting more or less autonomously since the mid-1990s. They both have large populations of ethnic Russians living there, and Russian peace-keeping forces ensure their autonomous status. Georgia resents this, of course. Saakashvili came to power vowing to regain control of the break-away provinces. He can't do it on his own, though. Russia is bigger and badder than Georgia. When Georgia sent its troops to support the US cause in Iraq, we gave them military training and weapons in return. Somehow, somewhere, Georgia got the idea that the US might support their attempt to reclaim control over South Ossetia and Abkhazia. Tensions have been building since the spring. In April, Georgia conducted reconnaissance missions into Abkhazia, and the Russians responded by shooting down one of the planes. More recently, separatists in South Ossetia have become more aggressive, launching small-scale attacks along the border. Meanwhile, the US is standing by, promising to support Georgia's bid to join NATO. Which brings us to point #3. 3 - The Russians are pissed off at the US. And they are pissed about the US meddling in Georgia. This last issue is one they can do something about, especially now that Georgia has given them an excuse. Which brings us to point #4. 4 - The cease-fire does not really settle anything. The Russians have agreed to pull their troops and tanks out of Georgia, but they did not agree to leave the so-called autonomous regions. In fact, the Russians have implied that they will not allow a return to the status quo. As far as they are concerned, Georgia lost its territorial claim over these regions when it launched an attack on the citizens of South Ossetia on August 7. Meanwhile, Saakashvili has not softened his stance, claiming they belong to Georgia and intending to assert Georgian control. 5 - And what of the US interest in all of this? Why are we so pro-Georgia anyway? Sure, we want to assert our influence in the former Soviet bloc. Sure, we want to promote democracy in the Caucasus. But what do we really want? We want to protect the pipelines that run through Georgia, allowing us to bypass Russia and gain direct access to oil and gas from the Caspian region. As far as I can tell, there are no good guys in this conflict. Not Russia, and not Georgia. And certainly not the US. Somerville, Mass - The life of a travel writer is not actually very exciting once the travel part is over (if you need any proof of that, you should click here and re-read my last post). Basically, I spend my days staring at the computer, and furiously trying to remember and record everything that I learned over the course of six weeks in Moscow - where to sample svekolnik and seld pod shuboy (if you don't remember what those things are, click here); where to sleep without maxing out your credit card; where to party like a Russian rock star; yes, even where to go skydiving. This is what I'm going to be doing for the next two months, so I might as well share... because I don't think the day-to-day account of what is growing in my garden is going to keep my readers coming back! Anyway, a friend of mine sent me this little excerpt from the Wall Street Journal. Not that I needed any more evidence that Moscow is the most expensive city in the world, but here it is. Note that these were the *cheapest* rooms available at the hotels in question. Ouch. (1) Which one of these hotels did you stay in? Um, none of them. I briefly considered staying at the Ritz-Carlton... then I realized that I could stay there for one night or I could stay in my comfy cozy apartment for one month for the same price. (2) Don't you stay in the hotels that you review? Sometimes, but not this time. Anyway, I never stay in every single hotel that I review, because that would be impossible. I will write more than 50 reviews about Moscow hotels and I was in Moscow for 40 nights. Do the math. But never fear, I do visit every hotel... I ask to see the rooms; I poke around the bathrooms; I look in the closets... I have to admit that taking a tour of the sumptuous spa and the rooftop restaurant at the Ritz is kind of fun. The work really starts when I have to inspect the shared bathrooms and common kitchens at backpacker hostels and Soviet-era hotels. Not always pretty. (4) Are there any other options? Happily, this little list published by the Wall Street Journal is not the whole story about sleeping in Moscow. I was thrilled to discover a whole slew of new hostels catering to backpackers and budget travelers. This really did not exist three years ago (the last time I worked on this book). So if you don't mind sleeping on a bunk bed and sharing a bathroom, you can do that for less than $40. (5) What if I am a regular person - not a backpacker but not a billionaire? There is a pretty wide gap between $40 and $400. How much will I have to pay? Unfortunately, this is where Moscow really falls short. There are midrange hotels, but they are horribly overpriced. Western travelers will be shocked (!) when they see what their $150 gets them. Somerville, Mass - These days in the pink house, a lot of excitement is generated by what's happening outside in the backyard. I came home to a garden in full bloom, overflowing with black-eyed Susans, honeysuckle, morning glories, lilies, cosmos, roses and more. Meanwhile, the chickadees (the state bird of Massachusetts!) have been regular visitors to our bird feeder all summer. We also see blue jays, cardinals, and downy woodpeckers, amongst the many many sparrows. Sometimes when I am supposed to be working, I find myself staring out the window, watching the birds jockying for position at the feeder. Yesterday I glanced up to see a pair of gold finches fluttering about the cosmos! For years we have tried luring the finches with thistle, but they paid no attention to the special finch feeder. Only in August, when the cosmos are in full bloom, do the finches show up to munch on their seeds. A few days ago, we went out in the evening to fire up the grill. Going out the back door, we startled a skunk family, who hustled across the yard and into the brush. Two little guys, sniffing around the yard. I thought that was the end of it. But a few hours later, while we were eating dinner outside, they scooted back across the yard and under the porch! We very quietly and very quickly went inside. But the next morning I peeked under there and I could see that somebody had tunneled underneath the house. I think the skunk family has some sort of luxury suite underneath our pantry! Who knew there was so much wildlife in Somerville? It's only a little plot of land, but it's like Animal Kingdom out there.